Patrick Gleason, director of state affairs at Americans for Tax Reform, wrote the following column appearing in Forbes on the success of Act 10. Gleason prominently features the MacIver Institute’s work analyzing the savings of Act 10 at its fifth anniversary. 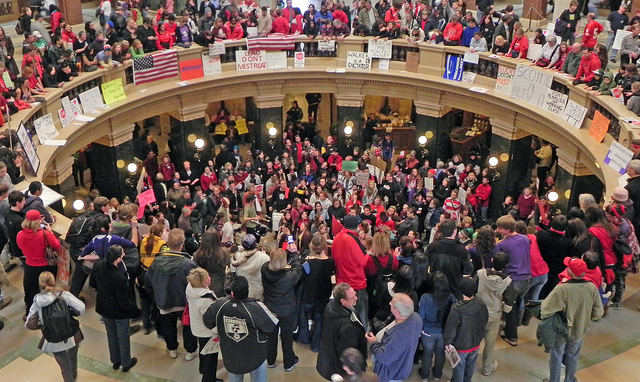 Five years ago today, protestors filled Wisconsin’s state capitol and Democratic state senators were hiding out across the border in Illinois to block a vote on Act 10, the landmark entitlement reform package ultimately signed into law by Gov. Scott Walker in March of 2011. A half decade after this historic legislative battle – in which President Obama himself weighed in, while AFL-CIO head Richard Trumka, Randi Weingarten, and other national union bosses directed tens of thousands of union protestors to descend upon Madison – it’s a good time to look at the legacy and real world impact of Act 10. The good news for Wisconsin taxpayers is that despite the millions of dollars in damage that union muscle and college students did to Wisconsin’s capitol building while protesting, the policy changes implemented by Act 10 ultimately saved taxpayers billions. – Limits collective bargaining to wage negotiations, and requires annual union recertification. – Requires government worker pay increases in excess of the rate of inflation be subject to voter approval. – Ends automatic deduction of union dues, requiring union bosses to make the case to workers why they should join and financially support a union. – Requires government workers to start contributing something toward their health insurance and retirement savings. According to a recent report by the MacIver Institute, a free market think tank based in Madison, Act 10 has saved Wisconsin taxpayers over $5 billion. What really stands out in the MacIver Institute report is how Act 10 brought savings to government entities of all sizes, from small towns to large state departments, with nearly 500 units of government each achieving over $1 million in savings. To commemorate the tremendous savings that Act 10 has generated for Wisconsin taxpayers, the MacIver Institute is celebrating this month as Wisconsin Taxpayer Appreciation Month. In addition to the savings and income tax relief that Act 10 has permitted, it has also given workers a choice as to whether to join and financially support a union. Workers have been exercising this freedom a great deal over the last five years. Since 2011, AFSCME District Council 40 in Madison has seen its membership decrease by 70% and funding drop by 63%, while AFSCME District Council 48 in Milwaukee has seen membership and receipts fall 69% and 83% respectively. What’s really impressive is how Gov. Walker and Wisconsin legislators, after getting the budget repair act done, have continued passing significant and much-needed reforms that require a great deal of political courage. Last year, Wisconsin became the 25th state to pass Right to Work legislation, freeing workers from being forced to join a union as a condition of employment. That was followed up with a repeal of prevailing wage requirements that drive up the cost of taxpayer-financed municipal construction projects. Gov. Walker, Lt. Governor Rebecca Kleefisch, and Wisconsin lawmakers have enacted an impressive slate of free market reforms over the last five years. Unions can spend a lot of money and bring in out-of-state help, but legislators who voted for Act 10 have saved Wisconsin taxpayers billions of dollars and have a strong case to make on the campaign trail this fall. Read the original article at Forbes here.